When people find out that I have created a few picture books I am often asked, "Mark - how old are you, what's your favorite color and what's your social security number?" After I dodge all of those questions (My favorite color, really? That's getting too personal.) I am often also asked, "How do you make a picture book?" And that's a question I'm happy to answer. I know several people who also make picture books and most of them make much more lovely books than I do. But what's interesting is everyone does it in a slightly different way. I'll describe how I do it but I'm positive that you will, in your creative meanderings, find a way that suits you perfectly. So feel free to use this as a starting point and than you can improvise to find how you should do it. Because everyone will have a slightly different method. There it is - THE sketch that inspired the book. This is from a sketchbook filled with doodles. BTW this drawing was done while at an SCBWI conference sitting in the audience. 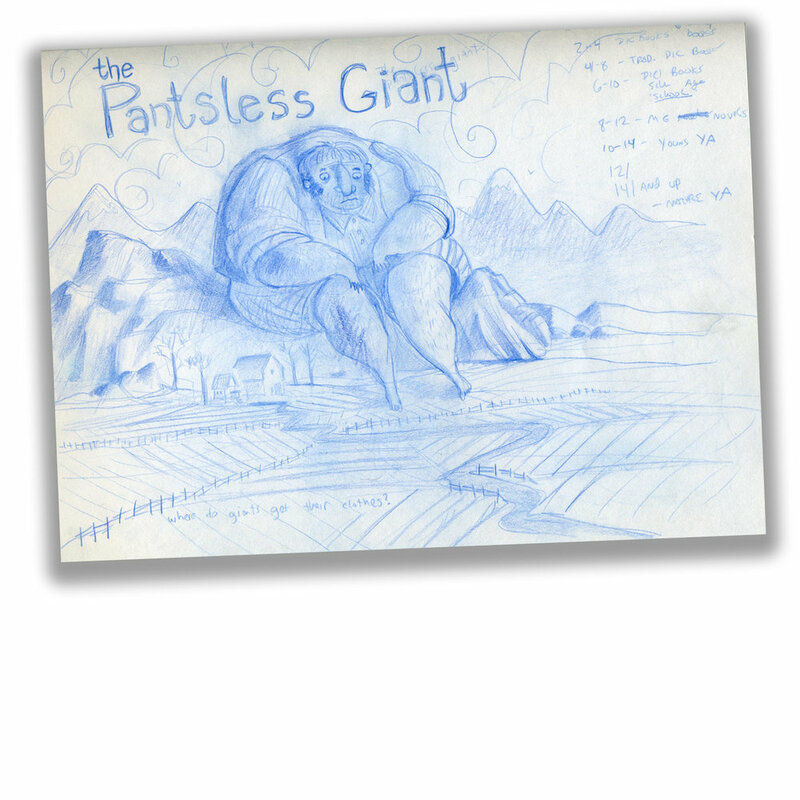 Giant Pants is a picture book that I worked on for more than 8 years. Yeah, I'm slow. Really slow. The idea started with a doodle in a sketchbook and I spent the next 8 years writing ideas and outlines that never quite worked. My agent read a few drafts through the years and offered good advice. But I still didn't have a story that worked. Many drafts later, I finally had a story my agent thought was good enough to send out. So what happened between draft 1 and draft 265? Did the aging process produce a ripe idea, better for the plucking? Maybe. The story became more and more complicated until - it got really simple. And that's usually how I work. I over-write. And I have to take the long way around the mountain. But once my agent thought I actually had a decent story - I put together a dummy. 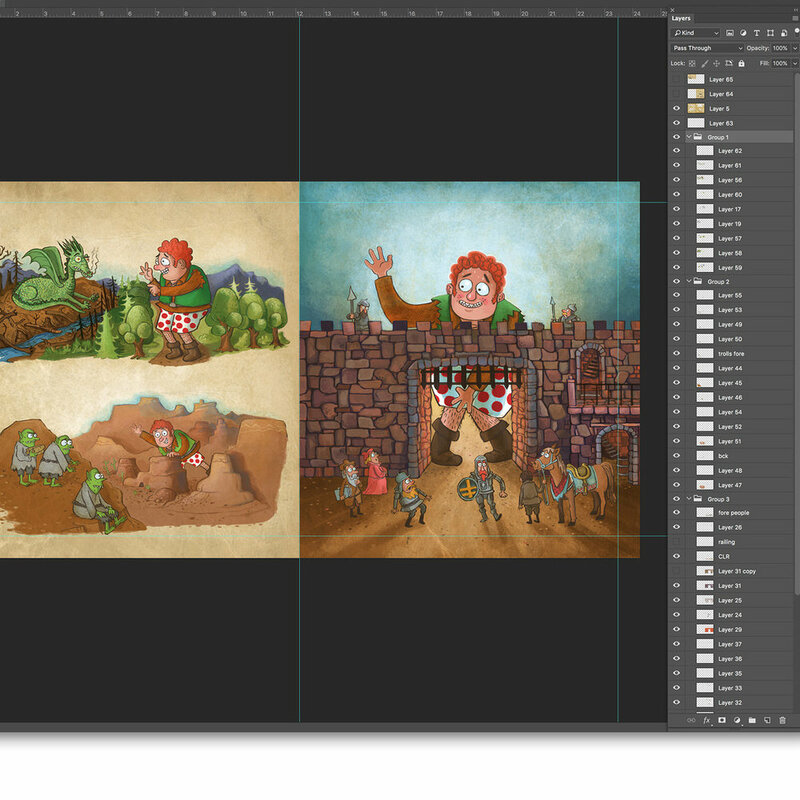 These are screen captures from the PDF book dummy for Giant Pants. As you can see the art is very rough, except for one example of how I thought I'd like to paint it. 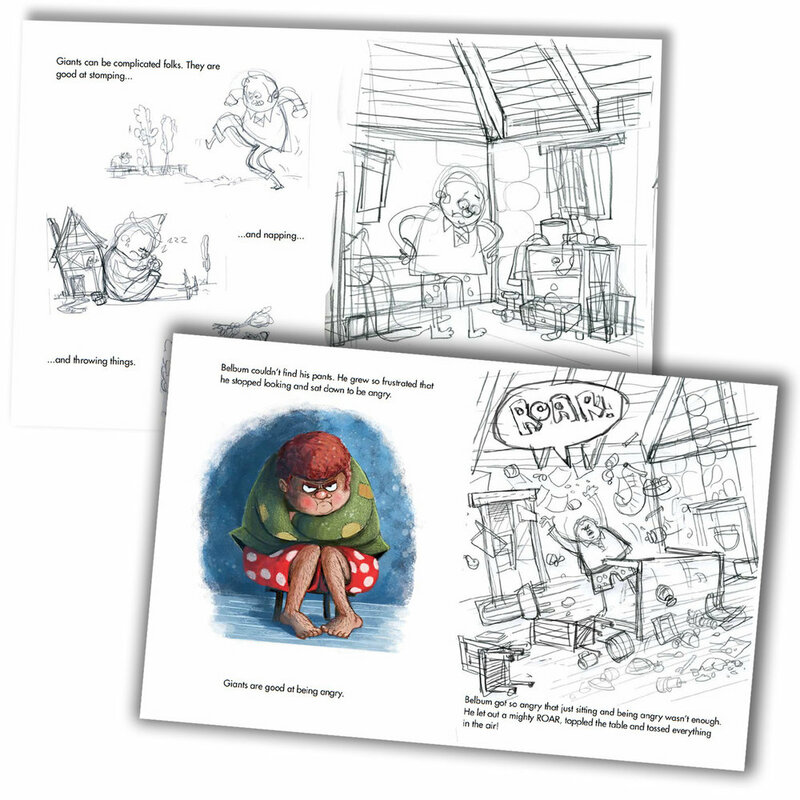 Notice that the painting style and character design change in the final book..
A picture book dummy consists of all 32 pages with quick drawings and one or two more-or-less finished pieces of art. This means an editor will see your book in true book form, along with art and a good idea of how you want to 'finish' the pieces. This matters because I am working as an author/illustrator on a project like this so it all needs to work together to convince an editor that you can pull it off. I worked for about 2 months on the dummy. I scanned in pencil drawings made changes in Photoshop and put the book together in Adobe InDesign and exported as a PDF. The art in the dummy doesn't look like the art in the final book, the character is different and the story ended up with a few revisions once an editor accepted the manuscript. But the dummy is the best way to show the entire story; beginning, middle and end. It has everything an editor needs to make a decision. A book dummy helps you get your idea into Picture Book shape. I always discover problems and make changes at this stage. For me making a picture book means constantly adjusting and revising the project. It is not a straight line from idea to published, highly acclaimed book. Step-by-step in Photoshop my drawings become paintings. I create a LOT of layers. It's kind of a nightmare actually. I was lucky. An editor acquired the book and we started in. At this point final dimensions of the book are set and I adjust the art to fit if need be. We also start to discuss the overall design (fonts), cover and endpaper ideas. There were story changes and quite a few changes from the pagination in my book dummy. Events moved about and some story elements became double page spreads that were once spot illustrations. With the assistance of the editor and art director we kept shaping the book until my story was as clear as it could be and the humor and drama were enhanced. Rough drawings are reviewed and returned to me with notes. Slowly the final pages are decided on and I start painting. I paint in Photoshop. I still make changes when I begin to paint pages. I wish I could better contain my process so when I start painting, I am just worried about painting. But I seem to need spontaneity in the work to stay interested and energized. Every time I begin a book I try and get better about doing the book in an orderly process from sketch to final art, but I still make changes across the entire process. You will notice that I started painting the castle wall using bricks, but the final art uses large stones. After anywhere from 8 months to a year of painting I digitally deliver the final pages and the book is done. I will get a color proof in a month or two to make sure it's all looking good and about 9 months to a year after that the book will arrive. It's always exciting to get the box of books delivered. I sometimes wait days to open them because I'm so nervous about what it will look like. After all the false starts, mistakes, frustrations, changes, revisions and alterations through years of work, it's as scary as it is fun to crack the first one open and look at it. You can order a copy of Giant Pants into any favorite local bookstore if they don't have it on their shelves or grab it online at Amazon.